With its annual Christmas Book, Neiman Marcus has released a list of extravagant gifts you could give yourself this year. One of which is a $344,500 Aston Martin Vanquish Volante, which is probably the most rational item on the list. In keeping with the store's tradition of offering up a special car for the holiday season, the Neiman Marcus edition Vanquish is offered at $344,500. That's a pretty big jump over the standard Vanquish Volante's $297,995 base price. But remember, this is one of just 10 of these special editions that will be built. All 10 cars will be painted in Seychelles Blue – a color exclusive to this edition – with Atlantic Blue fabric tops, blue brake calipers and black leather seats with Neiman Marcus embroidering so you remember where you bought the car. 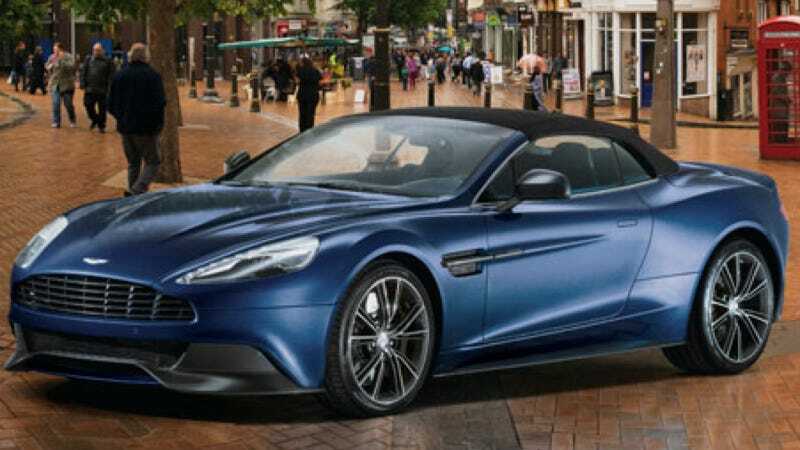 As in the normal Aston Martin Vanquish, this Neiman Marcus Volante gets the 565-horsepower V12 with the six-speed automatic and 0-60 in, oh, 4 seconds. A four-piece matching luggage set is included, but that'll probably take up the space you were going to use for more shopping. If all of this interests you and there is no substitute for the Neiman Marcus edition, you'd better be one of the first on the phone at noon EDT on October 23. Miss out on the 10 and you'll have to settle for a plain ol' ordinary Vanquish Volante this year.